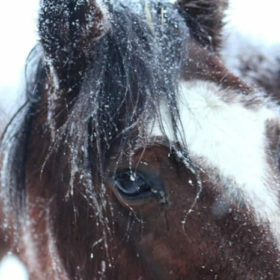 The Mustang Center operates mainly from the donations of our supporters. 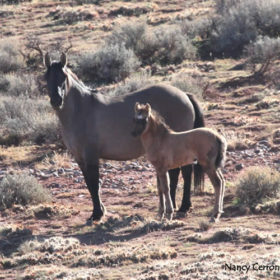 Your contributions go directly to serving our mission of “preserving and interpreting the Pryor Mountain mustangs.” See the options on our Donations page to determine how you would like your contributions to be used. December 22, 2013: It’s Winter in Wyoming! Yesterday was the first day of winter. And winter came into Wyoming with a blast that continues today. The Pryor Mountains are covered in clouds which are most certainly covering a world of white! 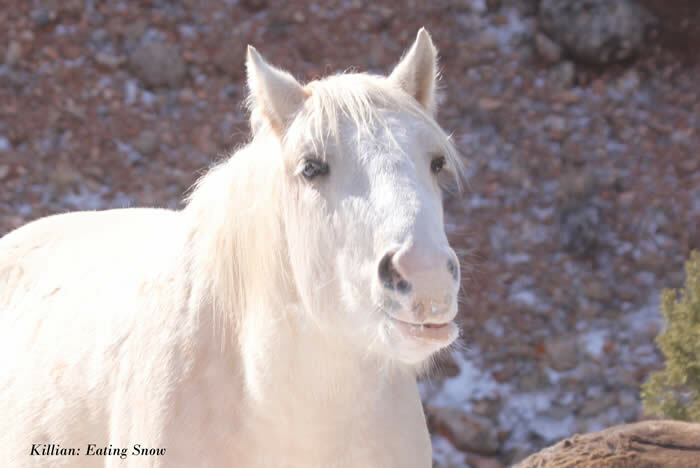 The photo below shows Exhilaration, adopted Pryor Mountain Mustang, on this snowy morning We send our wishes today for a very Merry Christmas and a memorable New Year! The calendar might not say that it is winter yet, but the weather tells a different story. A strong wind ushered in a cold front that has settled into the Big Horn Basin. Below zero and nearly zero weather is upon us! 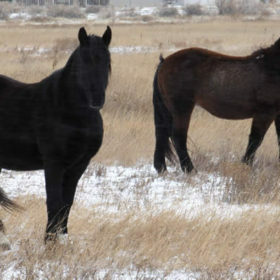 The wild horses have begun their seasonal migration down the mountain in search of protection and food. Snow has become an important water source. 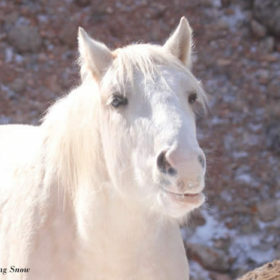 Watch for our PryorWild blogs and Facebook updates to stay informed of the winter activities of the Pryor Mountain Wild Horses. 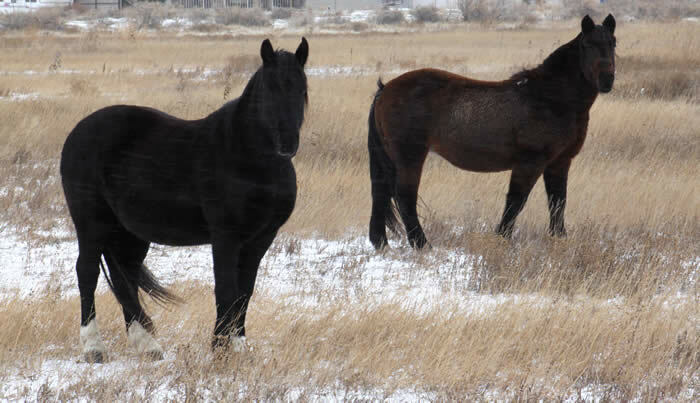 After several months, Stiles and Besa have settled into their new home at the Mustang Center. Both display their wild behaviors as they seek out shelter from the snow & wind, maintain a wariness around humans, and keep a watchful eye on their surroundings. Join us on Facebook! 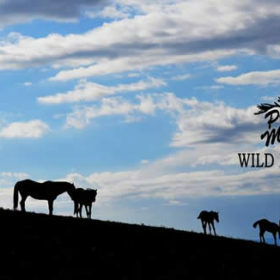 Our summer intern, Kassi, designed this original photo to serve as the image for our Pryor Mountain Wild Mustang Center Facebook page. We fill this with up-to-date and historical information about the horses and their Pryor home. We encourage you to search for us and “Like” us to show your support for these magnificent animals. La Nina: There’s a new foal in the Dryhead! 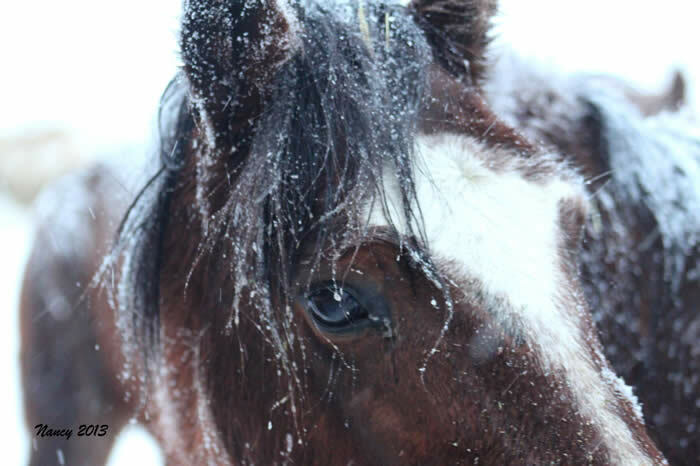 Bakken finally foaled in October, and is now with Blizzard, along with Cascade. 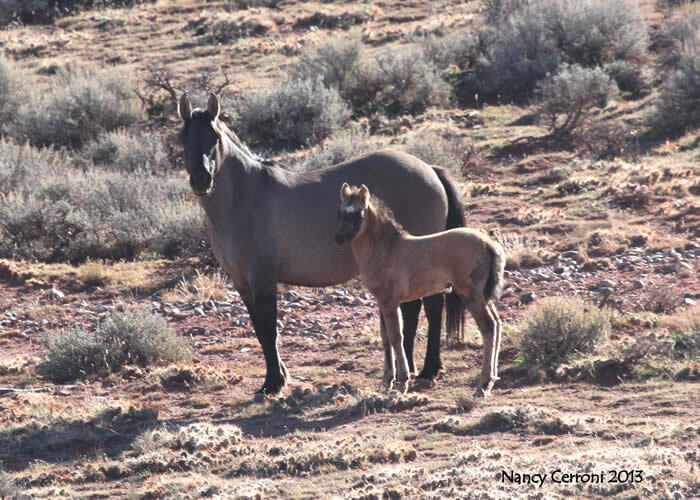 The newest addition to herd brings the total foal count 17, with 15 surviving. All website content, graphics, photos and videos are the property of the center and may not be reproduced in away way without prior written permission.